What could be better than a homemade peanut butter cookie or a rich chocolate brownie? Both, fused together in one sweet bite! 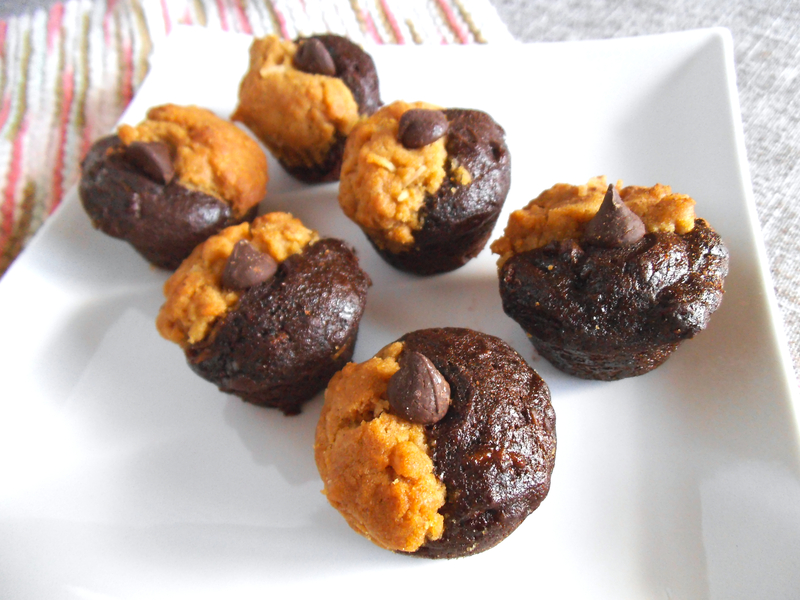 No one else will notice the healthy ingredient hidden in the dark side of these tempting treats. Brown sugar, honey, and (spoiler alert) carrots lend sweetness to the two-in-one bites you see here. The results are healthier than your typical candy, yet still delicious–and, I would argue, more satisfying. I think the flavours are great for the Halloween season, if that’s something you like to celebrate. These dual tone bites also make a lovely, sweet afternoon snack any day of the week. Something you can indulge in with minimal guilt. Or you can opt to combine a classic peanut butter cookie recipe with your favourite brownie recipe to yield rich, decadent treat. It is hard to go wrong with the taste of peanut butter and chocolate either way! Mix together 1/2 cup coconut flakes, flour, and baking soda. Stir in peanut butter, brown sugar, egg white and vanilla until an evenly mixed dough forms. In a separate bowl, stir together cocoa powder, flour, salt, and baking soda. Add carrots, oil, vanilla, honey, and brown sugar. Blend with a fork or electric mixer until a relatively smooth batter is formed. 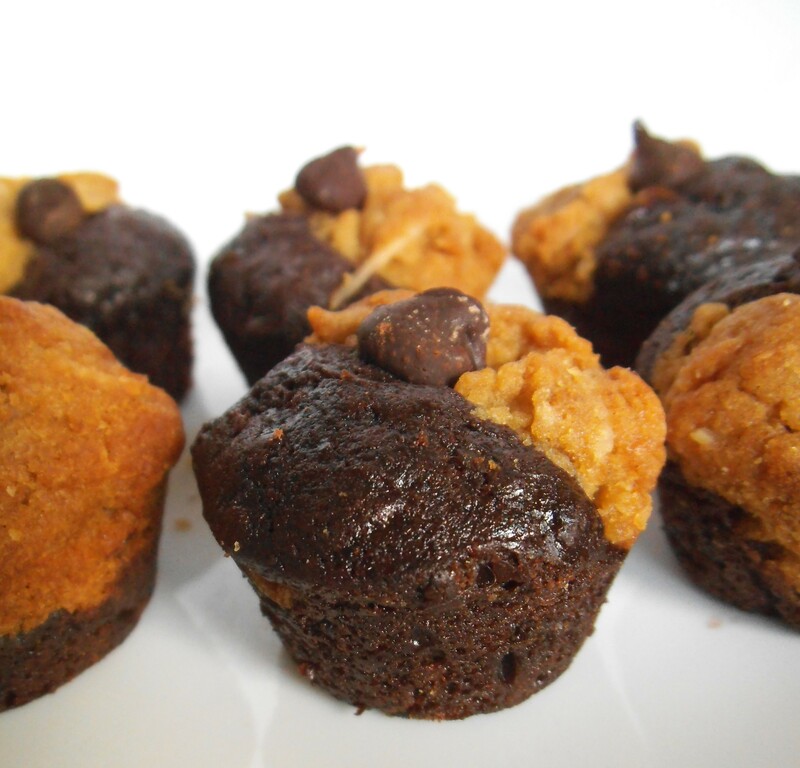 Into a greased mini muffin tin, add a spoonful of peanut butter dough to one side each cup. Add a spoonful of brownie batter to the other side. Top bites with chocolate chips (optional). Bake at 350 degrees F (180 C) until middle tests done, about 14 minutes. Let the bites cool before removing them from the cups. Store tightly covered. Best within 2 days, or store in the freezer for future use. * I prefer to use ethically sourced chocolate chips. For this recipe I used Kirkland’s Signature brand from Costco. Join me in October for Muffin Tin Month and in sharing inspiration here. This recipe will also appear at Fiesta Friday this week! Wow! This looks like you have 2-in-1 muffins/cupcakes. What a brilliant way to enjoy the best of both worlds. Very impressive. I love the peanut butter chocolate flavors! These are so CUTE and delicious looking! I love the carrots in the brownie batter! Makes me want to go bake carrot cake brownies! YUM! Thanks, Reeni. You should go for the brownies! Frosting them would offer a lot of delicious possibilities! This is such a good idea! So cute!! Yum, love these and thank you for bringing to the party. Chocolate and PB, the best combination. Beautiful, Julia! I just want to grab one and eat it right now 🙂 . Chocolate and pb are my ideal breakfast! These are certainly healthy enough for breakfast. Enjoy! These look so good, I’d eat multiple ones if they were in front of me right now. Thanks for linking up to Sweet and Savoury Sunday, stop by and link up again. Have a great day!! This looks SO TASTY! I’m definitely making these this weekend!